If you love cheering crowds, furry little animals and food on sticks, join us at the State Fair…it’s almost that time of year. And there is still time to enter if you jump on it (pun intended). The Fair accepts late entries for a small additional fee. Visit http://r20.rs6.net/tn.jsp?e=001a_GsfiBo1bG3C5HBtpeuUAOxU1CVPtWnU5FFiKgBJR7Cd_LjlggSKAqJVynHBGS-p0BheZgTAvFAhr_mnAVctEOkQ5RDjslDNcQQR3otMJU= and follow the links to the State Fair’s entry form. Dogs that like to win great prizes and get fancy ribbons will have a good chance if they want to compete on Tuesday, August 7th. Every dog that enters takes home a goodie bag valued at $20 provided by Zeus & Company. Prizes and ribbons are awarded for top jumpers. 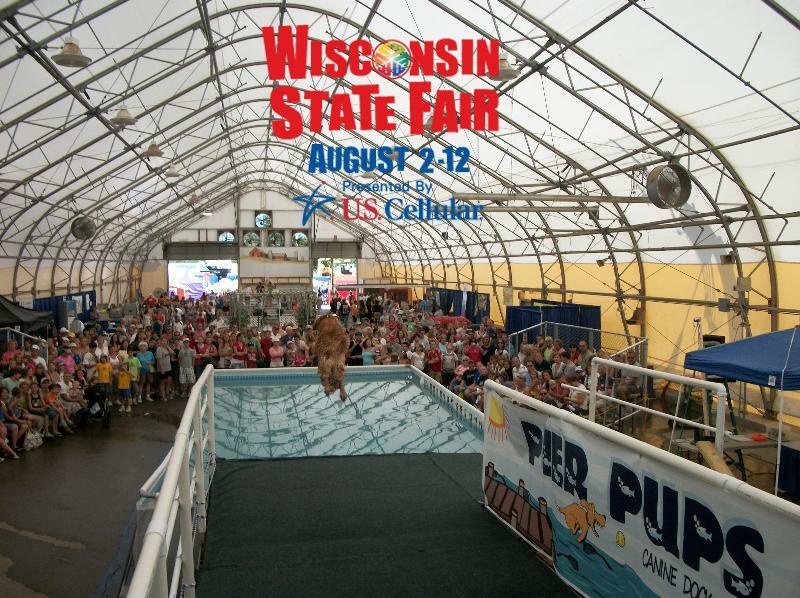 We will be at the State Fair Monday, August 6th through Thursday, August 9th with several competions each day followed by the grand finale, THE FINAL JUMP OFF, where the best of the best face off for the Grand Prize. So come on down and visit us in the Small Animal Palace where there will be lots of dog related activites, including vendors, demonstrations and the new Doggy Olympics. Vets Plus, Inc.(VPI), has been re-certified ISO 9001:2008 compliant, including its new, dedicated Soft Chew production facility in Menomonie, WI. Vets Plus has been ISO 9001:2008 certified since 2009. An internationally recognized standard for quality management systems, ISO 9001:2008 has become the global benchmark for quality assurance. Compliance is demonstrated through formalized quality standards and procedures for production, personnel training and process documentation. While re-certification audits are required every three years, regular audits are conducted each year to monitor implementation of ISO 9001:2008 standards for continued compliance. “Preparing for the audits helped us find and prioritize areas of improvement in our quality procedures, especially with regard to our new Menomonie Soft Chew production facility,” says Dr. Anita Sinha, Director, Quality Management. “Great care is taken to control all factors and activities that affect product quality and safety, from purchasing of materials and ingredients to manufacturing and shipping the final product. Maintaining ISO 9001:2008 compliance is an on-going process as VPI continues to grow, and we are committed to upholding the highest level of excellence to support our customer needs,” says Dr. Sinha. Both VPI facilities are certified as ISO 9001:2008 compliant through May 2015. Vets Plus, Inc. (VPI), located in Knapp, Wisconsin, is a leading manufacturer and distributor of animal health and nutrition products, including Probios®, Replamin®, Swine Prefer™, Pets Prefer™, Goats Prefer™ and Horses Prefer™ product lines. Founded in 1990 by entrepreneur Raj Lall, VPI began manufacturing and distributing animal health and nutrition products. By 2002, VPI had formed a strategic marketing and manufacturing alliance with Chr. Hansen in Denmark, thus earning the license to market and manufacture the Probios® line of products. From 2005-10, VPI, was known as BOMAC Vets Plus, Inc., after a partnership agreement was reached with Bomac of New Zealand. During that time, the company also formed a strategic marketing and manufacturing alliance with Albion Animal Health on Replamin® and Pull Thru® brand products (2008). Following the acquisition of BOMAC New Zealand by Bayer (Germany) in late 2010, the company has successfully transitioned back to Vets Plus, Inc., and now boasts 100,000 square feet of manufacturing / warehouse / office space. VPI is proud of its continued growth into a leader within the animal health industry and ability to manufacture more than 350 products, while maintaining ISO-9001 and NASC certifications, and remaining cGMP and AFFCO compliant. VPI is also a member of the American Pet Products Association (APPA). Stuff That Infinity…to Infinity and Beyond! going. Check out our Wish List for shopping ideas. In excess of 1,200 people were in attendance during the Milwaukee Emergency Center for Animals’ first annual “MECA Vest a K-9 Fest” to raise awareness and much needed funds to vest Wisconsin’s police dogs with bullet and stab-proof vests and to assist Wisconsin Police K-9 Units purchase the finest dogs and equipment needed to protect and serve the public. The extraordinarily successful event raised more than $30,000, in which all proceeds fund the MECA Wisconsin Police Canine Vest Foundation, Inc. The foundation is committed to ensuring all police dogs in the state are provided with protective K-9 police vests. Nationwide, more than 12 police dogs die every year in the line of duty. There is in excess of 235 K-9 officers in the state of Wisconsin alone. Police dogs are important and invaluable partners to our nation’s law enforcement and play critical roles in fighting crime in our communities by saving the lives of citizens, as well as our dedicated police officers. Held on the grounds of the Milwaukee Emergency Center for Animals (MECA), attendees enjoyed a multitude of educational and entertaining outdoor events, including police dog demonstrations, agility demonstrations, food, raffles, and music and entertainment by eight-time WAMI award winner, Ronnie Nyles and more! Milwaukee Brewer teammates Cody Ransom, Mat Gamel and Martin Maldonado attended the event to meet and greet their loyal fans, as well as show their passionate support of the foundation’s vital cause. The Milwaukee Emergency Center for Animals (MECA) would like to sincerely thank them for championing the event, as well as the many donors, vendors, volunteers, local businesses and police departments who participated, which included the Greenfield Police, Milwaukee County Sheriff, Milwaukee Police Department, Glendale and Browndeer Police Departments. Additional thanks go to Dawn Guenette who coordinated the ball players, Wendy Strong, television reporter from the Business Journal and Stan Kass for sponsoring and donating to the cause. For more information and to view additional photos from the highly successful event, please visit the MECA Wisconsin Police Canine Vest Foundation, Inc. by logging onto www. mecavestak9policedogwi.org or www.erforanimals.com. The MECA Wisconsin Police Canine Vest Foundation, Inc. is a not-for-profit organization working in conjunction with the Milwaukee Emergency Center for Animals and Specialty Services (MECA) to protect every police dog in the state of Wisconsin by providing them with bullet proof and stab proof vests. IT’S HAWS’ BIRTHDAY…AND WE’RE GIVING THE GIFTS! To celebrate this great anniversary of our shelter, all week ADOPTERS are receiving a gift! Adopters can show their own birthdates to HAWS Adoption Counselors, and receive that dollar amount as their adoption fee! Born on the 28th of the month? Adoption is $28. Born on the 13th? Adoption is $13. And the lucky ones born on the 1st…pay an adoption fee of only $1! I.D. required. Limit one special pet pricing per household. Additional pets adopted at the regular fee. 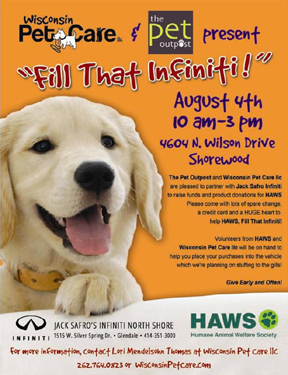 Adopt – Learn – Join – Volunteer – GIVE…CELEBRATE the HAWS Cause…all week long! A very special puppy has stolen the hearts of staff members at the Wisconsin Humane Society and indeed, it’s fairly impossible to resist her sweet puppy face. WHS is hoping a special appeal this weekend will help them raise the funds necessary to cover her recent amputation surgery. 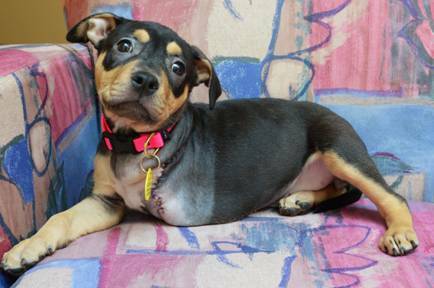 Thumbelina is an 8-week-old American Pit Bull Terrier mix puppy who arrived at the shelter because of a congenital deformity in her left front leg. It wasn’t growing properly and her family was unable to care for her any longer. The cost of her surgery and medical care is expected to reach about $2,000 and WHS is asking for help with her special medical expenses. To make a contribution, visit wihumane.org or call 414-431-6121. The Wisconsin Humane Society receives no government funding and relies entirely on the support of the community to annually care for 20,000 animals. The organization is recognized by Charity Navigator, the nation’s leading charity watchdog group, as a 4-star charity, its highest rating.